Early in the 20th century astronomers noticed that distant galaxies had peculiar light spectra. Specifically, the galaxies' light spectra were shifted toward the red end of the spectrum. In 1929 astronomer Edwin Hubble compared the galaxies' spectra with their distances, calculated using different methods, and showed that the amount of "red shift" was proportional to distance. Hubble and others realized that the most obvious explanation for the "red shift" was that the galaxies were receding from Earth and each other, and the farther the galaxy, the faster the recession. These examples are greatly exaggerated. for an example of doppler shift. This conclusion is based on a cosmological effect roughly similar to the everyday "Doppler shift." Doppler shift is what makes a car's horn sound lower-pitched as it moves away from you. It turns out that a different version of this everyday effect applies to light as well — if an astronomical object is moving away from Earth, its light will be shifted to longer (red) wavelengths1. 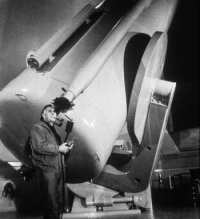 In 1948, Russian-born physicist George Gamow took the next step by realizing that if all the galaxies are flying apart at high speed (an idea originally proposed by Georges Lemaître), the entire universe must have been concentrated in a single point at some time in the past. 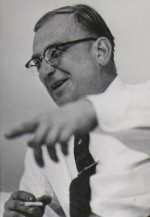 Another scientist, Fred Hoyle, coined the name "Big Bang" to disparage this idea, but the term became popular and has prevailed to the present day. A static universe, one that is not expanding, cannot dispose of stellar energy. This kind of universe heats up over time (example). In contrast, an expanding universe continually increases its volume, which accommodates the increasing quantity of energy produced by stars, therefore the temperature of the universe does not increase. In fact, in some forms of the Big Bang theory, the universe's expansion causes an overall decrease in average temperature. Ours may be such a universe. After thinking about this issue, Gamow and his students predicted there would be a leftover radiation signature from the Big Bang, and they realized it might be detectable. Gamow calculated the original temperature of the explosion, took into account the temperature reduction that would be caused by the universe's subsequent expansion (review the physics) and arrived at an "afterglow" temperature of about 5 Kelvins. In the 1960s Arno Penzias and Robert Wilson were working at AT&T Bell Laboratories, trying to improve microwave communications by reducing antenna noise. They found a noise in their antenna they simply couldn't remove. They considered all kinds of possibilities including bird droppings, but nothing helped. If the antenna was pointed at the sky, the noise appeared. The pointing direction and time of day didn't matter. Finally they called an astrophysicist at Princeton, who told them what the signal probably was, hung up the phone, turned to his associates and said, "We've been scooped." The annoying noise was, in fact, the primordial radiation left over from the Big Bang. Penzias & Wilson won the Nobel Prize for their discovery. 1. Cosmological redshift only superficially resembles Doppler shift. In cosmological redshift, space itself expands, which stretches light waves passing through it, increasing their wavelength and shifting them toward the red end of the spectrum.